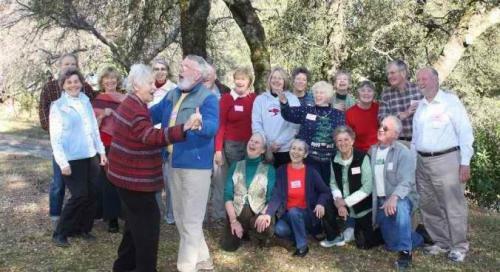 A special cohousing neighborhood with amenities for proactive adults has been built in the Gold Country of the Sierra foothills in Grass Valley, California. The wooded site is on a hill bordered at the bottom by free-flowing Wolf Creek. It is walkable to shopping, grocery stores, and restaurants. It is also a short walk or bike ride to historic downtown Grass Valley. Of the 7.9 acres total, one-third will be preserved as natural habitat. We are a group who share a common vision of allowing people to age in place with grace and dignity while living in community. We include attorneys, teachers, journalists, engineers, medical/dental professionals, nonprofit administrators, musicians, world travelers, bicyclists, kayakers, retirees, and more. We have no age restrictions and our members now range in age from their fifties to ninety+. Wolf Creek Lodge houses 30 condominiums and enjoys the convenience of both above and underground parking and elevator access. Members enjoy a large, state-of-the-art kitchen and dining area for optional community meals, laundry and activity space, a beverage/coffee bar, and an inviting sitting area in the 4,000-foot common house. Outside amenities include a hot tub, Petanque court, a large terrace with barbecue, and inviting, environmentally appropriate landscaping. The Lodge is self-managed by the entire group and decisions are made by consensus. Environmental sustainability is a central value, taking into consideration everything from energy efficient heating and water systems to solar orientation and the use of sustainable, non-toxic building materials. Construction began in the fall of 2010, and move-in began in October of 2012. Our friendly and diverse community is still welcomes visitors and new members. Homes become available from time to time. Check our website for currently available homes. Please visit the Wolf Creek Lodge website to learn more about our community.